After spending ten days at Vikings training camp, Daniel House discusses five areas that stood out during his time in Mankato. The Vikings have injected their roster with a plethora of young talent. The coaches have been rotating players and are trying to find the right mix to insert within certain packages. With a talented rookie class and some young veterans returning, the Vikings organization is heading in the right direction. In 2015, the biggest key will be improving as an offensive line. Along with that, it will be critical to become a team that defends the run better and performs well on special teams. All of these areas were a major point of emphasis during my time in Mankato. The preseason will be an excellent time to evaluate some of these young players to see how they handle top-tier competition. Not to mention, it will be a time to see how much the squad has improved upon the areas that were emphasized in training camp. When I analyze the way players performed in training camp, my eyebrows instantly rise at the thought of how good the rookies looked. Trae Waynes started camp slow, but is becoming more comfortable with the scheme and the expectations of the defense. By the time I left training camp, he was really starting to contribute. 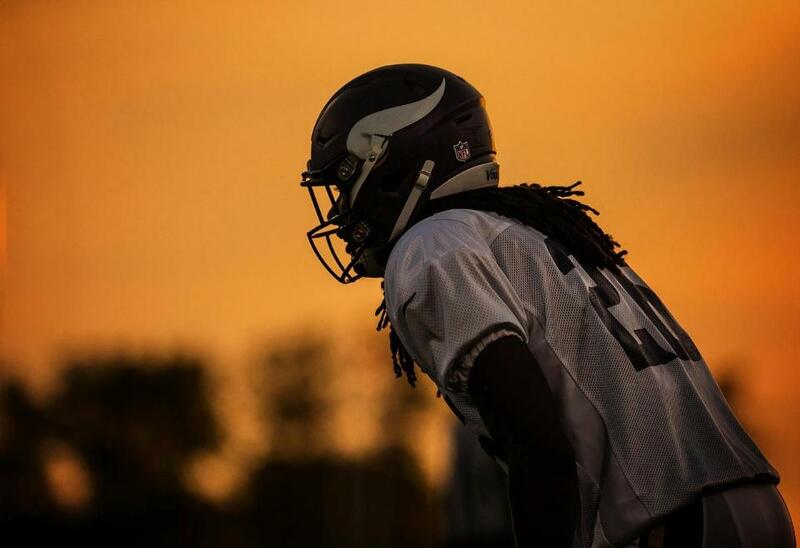 Waynes is starting to handle the physicality better and will need to continually improve his ball skills. Eric Kendricks was rising up the depth chart and flashed his coverage abilities the most. As practices evolved, he was showing he could handle run defense as well. He has a chance to start at nickel linebacker and will be eased into a starting role in the base 4-3 defense. Danielle Hunter was a very raw, athletic player when the Vikings drafted him in the third round. At first glance, it didn’t seem like he was as rough around the edges. He looked solid in 1-on-1 drills and was consistently making plays in run support. Mike Zimmer even commented about how much further ahead the coaches thought he was in training camp. T.J. Clemmings, Austin Shepherd, and Tyrus Thompson are all rough around the edges, but have developmental talent that can be groomed for the future. MyCole Pruitt played a major role in the scheme in training camp. He flashed as a fluent route runner and respectable run blocker. He will contribute immediately in the Vikings’ offensive scheme. Stefon Diggs has a great chance to land the Mr. Mankato award. Every practice, Diggs was finding ways to get open, while making some extremely difficult catches. He also managed to handle the physicality of press coverage and ran routes well enough to get open. Edmond Robinson has excellent size and is definitely a practice squad candidate. It’s early, but it doesn’t seem like the Vikings swung and missed on any player in this rookie class. All of these guys will getting playing time in the preseason and it will be interesting to see how they handle the spotlight of real NFL contests. The biggest unanswered question mark leaving training camp is at offensive line. Matt Kalil really struggled in practice and the team is working veteran Mike Harris at right guard. Could Kalil be struggling because every player on defense knows his weaknesses? That very well could be the case, but Kalil will be seeing the best defensive end from the opponent every week. It isn’t time to press the panic button, however, it will be an area to monitor in the preseason. Mike Harris didn’t look terrible in practice, but there were certain moments when he really struggled. The key will be how Kalil plays on the edge and whether he can handle pressure. Brandon Fusco and Phil Loadholt both had excellent training camps and will each be the centerpieces of the left and right sides, respectively. John Sullivan missed a portion of training camp for the birth of his son. However, he performed well when he was there and will be the veteran leader of the group. If Kalil or Harris struggle, the Vikings have some young rookies who can step into the game and contribute. Growing pains will follow, but at least they have alternatives. The key this season will be how Teddy Bridgewater is protected. He needs a clean pocket and can’t hit the ground 51 times like he did in 2014. The offensive line will be monitored in the preseason and conclusions can’t be drawn until they square off with an opponent. For the first time in 14 years, I’m leaving training camp without a question mark behind the quarterback position. The Vikings have finally found a player that can be a franchise leader for the future. Teddy Bridgewater improved in so many ways and his confidence level is through the roof. He was frequently throwing extremely accurate passes into tight spaces of the defense. Not to mention, he has an excellent relationship with his wide receivers. Mike Wallace and Charles Johnson are always on the same page with Teddy and you can tell they know each others tendencies. With so many offensive weapons, Bridgewater can feel comfortable with his supporting cast. He didn’t play with Adrian Peterson in the backfield last year, which will definitely open more passing lanes for him. With another year in Norv Turner’s scheme, he has a familiarity with the terminology and the expectations of playing in the NFL. The biggest key will be keeping Teddy Bridgewater healthy and minimizing the amount of contact he takes on a weekly basis. It’s pretty simple — Adrian Peterson looks like a freak. He is ready to pounce on an opponent in a live game. Peterson might be in some of the best physical condition of his career. He was exploding through lanes and his cutbacks were extremely quick. One thing is certain: Peterson wasn’t sitting around during his year-long suspension. He used that time to become even more physically dominating. He didn’t see any contact and won’t until the Vikings open the regular season on September 14th in San Francisco. It is scary to think about the thought of Peterson being in the backfield, with Teddy Bridgewater making throws in the passing game. Teams won’t be able to stack the box and it will open up more lanes for Peterson to run free. With a year off and more offensive weapons, Peterson could be on pace for a fantastic 2015 season. For the first time in many seasons, the linebacker position group is full of depth. The Vikings invested in this position when they drafted Audie Cole and Gerald Hodges a few years ago. For the first time, they are now starting to develop with more coaching. Hodges was all over the field in training camp and the coaches are trying to find ways for him to see action this season. Audie Cole looked fantastic in run defense and has been seeing all the starting snaps in the base 4-3 package. Rookie Eric Kendricks flashed his abilities in both coverage and run defense and might see action with the first-team in the nickel package. Anthony Barr hasn’t been on the practice field in training camp very much and it is well-known he is trying to re-gain his conditioning after having knee surgery in the off-season. The biggest battle will be for the final roster spot between Mike Mauti and Brandon Watts. Each of them have value on special teams and it will come down to which player can provide the most value in the future. Chad Greenway is the leader and he has indicated on multiple occasions how talented this group has become. It definitely won’t be easy to trim this position and with so much talent in this group, it will be hard for them all to see time on the playing field. However, that’s an excellent problem to have and it hasn’t been the case recently. 2 more days till live action!